Volunteers can join his project on alternate Mondays throughout the year. 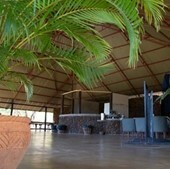 The project is located on the outskirts of the world-famous Victoria Falls, and close to Victoria Falls Town. The town takes its name from the famous Falls - a wonderful waterfall system that is one of the Seven Wonders of the Natural World. The canyon features thundering cascades, abundant wildlife and great blue stretches of sky. The town's lively markets offer plenty of trinkets and local treats to entice shoppers. Victoria Falls is known as Africa's adventure capital and volunteers who are so minded can do as much as they dare with activities such as bungee jumping, white water rafting, or zip lining. If that's not enough, they can hop across the border into neighbouring Botswana and take part in a full-day safari including a boat cruise and a game drive. This world-first lion rehabilitation initiative was founded from a vision to aid the rapidly declining lion population in Africa. Lion populations have plummeted from almost half a million lions sixty years ago, to as few as 20,000 to-day - and the number is still dropping! Very early on in the lion conservation efforts it became apparent that not only does the lion need attention, but so does it prey base, and also the vegetation on which the prey base feeds. In short, entire ecosystems need special attention. 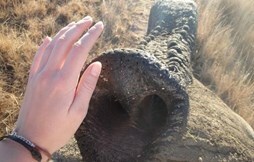 It was also realised just how important the development of the local community is to any conservation initiative. Over the past 15 years, and in partnership with ALERT (African Lion and Environmental Research Trust) a model has been developed to generate long-term funding through commercial ventures which provides sustainable assistance to various conservation and community development initiatives. This project is centred on 2000 hectares of prime forest estate, recently leased from the Government of Zimbabwe. Sadly, this once protected land had lost its purpose and was in a rapid state of decline. The project focuses on initially rehabilitating this area and then maintaining it as a haven for wildlife. The other major part of this project is the care and upkeep of the captive lions. These animals serve as the ambassadors of the work done, providing the attraction for the commercial activities that generate the funding, and at the same time providing educational opportunities as to the plight of all wildlife. No conservation work is complete without the growth and development of the communities surrounding the areas in which the work takes place. As such volunteers will also work with the dedicated ALERT team on their Human Wildlife Confli ct initiatives. Death as a result of these conflicts is a major contributor specifically to the decline of the lion population. Volunteers are welcomed to come and assist the team in their efforts to reduce this conflict and hence ultimately reduce the number of lion deaths as a result. Be at the forefront of various conservation initiatives in and around Victoria Falls. 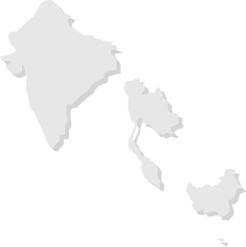 This area falls within the World's largest conservation area, spanningf five countries and covering more than 280,000 km squared. Play a vital role in the daily care and welfare of the resident captive lions, enjoying extremely close encounters on the daily walks. Protecting habitat is the number one requirement in any conservation effort. Join the team of dedicated conservationists who work tirelessly within this private reserve to ensure that an environment for ecosystems to thrive is maintained. Spend the days (and nights) tracking and monitoring wildlife in this area. No conservation efforts are complete without community support. 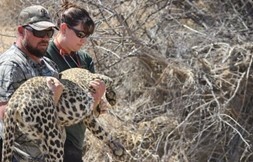 Help the team as they visit the communities surrounding the wildlife areas. Human-wildlife conflict is one of the biggest challenges facing conservationists today. Assist with innovative mitigation methods, as well as instilling a culture of conservation through conservation education classes. Immerse yourself in Africa's adventure capital - one of the seven Natural Wonders of the World. Fill your down time with adrenaline activities such as bungee jumping or white water rafting, or explore the pristine wilderness through scenic river cruises and wildlife safaris. Make friends for life by joining the volunteer family. 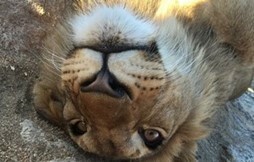 Lion Care: Volunteers will get hands-on with the care and upkeep of the captive lions. They will spend time with the cubs on one of their daily walks to familiarise them with their natural environment, encouraging them to investigate and explore the bush around them, and observe their natural instincts. There is a massive responsibility to ensure that the lions are well cared for, and volunteers will join the dedicated team in the daily upkeep of the feline family. They will prepare their food, clean their enclosures and develop ingenious enrichment activities designed to hone their natural instincts and test all their senses. Game Park Development: Having recently taken over the management of this 2000 hectares of prime forest estate, the primary vision is to develop a haven for wildlife in the form of a game park. Activities will focus on various projects designed to achieve this goal by creating an environment where ecosystems can thrive. Projects will include: game feeding, wildlife habituation, bush manipulation in the form of clearing or tree planting, road creation and maintenance, waterhole management and development, wildife surveys through camera trapping, tracking and monitoring, anti-poaching activities such as boundary patrols and snare sweeping, and so on. Community Involvement: A vital part of any conservation initiative involves the community that surrounds the wildife area. 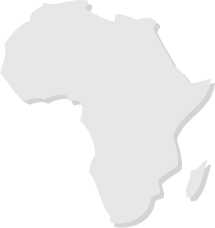 Africa is renowned for its lack of fences and wide open spaces. Unfortunately, this often brings conflict betweenj the wildlife and the local communities that live in the surrounding areas. These situations often end in distress with villages losing valuable resources in the form of crops or livestock, and wildlife losing their lives. Volunteers will join the dedicated team who spend their days out in the community as they get a handle on these issues and develop methods to try to reduce the level of conflict. Projects include attending to scenes of conflict, recording vital data, mapping predator movements through camera trapping and spoor surveying as well as strengthening livestock bomas and field fences to limit wildlife accessibility. A major part of this initiative is to help instil a culture of conservation within the communities through educational games and conservation education lessons. AM Group activities such as litter pick or snare sweep Day off! Victoria Falls is the adventure capital of Africa so take advantage by doing a bungee, horse ride, boat cruise and more! Victoria Falls gets its name from the majestic Falls which have been named one of the 7 Wonders of the World, and is also known as the adrenaline capital of Africa - a really fun-filled place for a volunteer project. Volunteers can spend their time off doing as many of the activities on offer as they wish - bungee jumping, white water rafting, horse riding etc - or perhaps even hop across the border in neighbouring Zambia. Throughout the placement all volunteers will have 24 hour support and guidance from the experienced project managers as well as from the staff of Amanzi Travel. Fly above the Falls in a helicopter – getting a bird’s eye view of one of the world’s seven wonders! 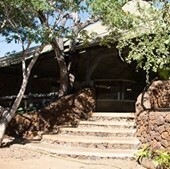 Volunteers should arrange to fly into Victoria Falls Airport where they will be met by a member of the project staff and transferred to the volunteer house - a short drive to the suburb that surrounds Victoria Falls..
Amanzi Travel holds an ATOL licence and can arrange any flight requirements that you have upon request. 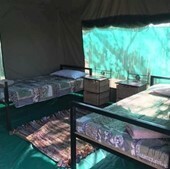 Volunteers will be accommodated at Fuller Forest which is on the edge of the Zambezi National Park and just a short drive away from the buzzing tourist town of Victoria Falls. 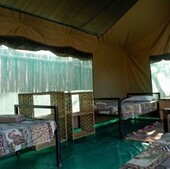 Accommodation is in spacious Safari Tents, sharing with 4 - 6 other same gender volunteers. There is a brand new ablution block with showers and toilets just a stone's throw away. 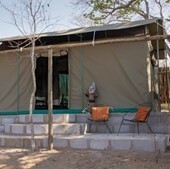 There is also a comfortable volunteer lounge for meals and to relax with fellow volunteers, enjoying the views of the surrounding bush and the local wildife. Daily housekeeping and a weekly laundry service are also included. Thank you so much for providing me with an opportunity to participate in the Lion Conservation project in Victoria Falls! I will never forget the numerous early morning walks I had with the lions and being able to get up close with them during their time outside of their enclosure. I particularly enjoyed using my creativity and teamwork skills in helping to construct toys for the lions by using only natural materials found in the local environment in order to provide them with a path towards behavioral enrichment. I also enjoyed partaking in the various research activities taking place within Zambezi National Park such as game counts and large predator occupancy surveys. These research projects were extremely interesting and offered a nice change of pace from my daily lion walks. I also appreciated being able to go into the local community and interact with the local population once per week by engaging in conservation education efforts in schools. During the weekends there were so many recreational and leisure opportunities available in Victoria Falls and surrounding places that it was sometimes hard to decide which ones to do. Plus I had the opportunity to talk and plan with the other volunteers that were also staying in the same lodge about the weekend activities we could potentially join together. Overall I would rate this project five stars and would highly recommend this to anyone who has an interest in wildlife and an adventurous spirit! I truly had an incredible experience from start to finish. This project was a perfect balance of both volunteering and vacation. I met wonderful people from across the world who I was able to bond with almost instantly, and truly felt that our work was making a difference for both the wildlife and community. Amanzi Travel made me feel confident in my excursion alone from the beginning stages of choosing a project all the way until the day before leaving. If you're on the fence about making the trip of a lifetime or choosing AmanziTravel, do it!!!! It will be everything you hope for and more. Thank you Amanzi Travel! Looking forward to choosing another trip with them in the future. Writing this made me feel so nostalgic - was such a great experience, I cannot thank you girls enough for all your help. Well, I can honestly say that I had the best experience of my life at the Vic Falls Lion project. It was my 30th birthday and I wanted to do something completely different - think I achieved that!! Pat & Gemma made the booking and everything up to departure such a smooth and easy process. I was never worried about travelling alone as I knew I would meet people there and I have made some great friends (volunteers as well as staff). You immediately feel welcomed and if you have any issues, there is always someone willing to help. My time at the project and Vic Falls was amazing, I went in with an open mind and joined in as many of the additional tours and excursions that I could, which was great! The lions were a joy to work with and be around, so much so that I miss them so much - it is amazing how close you get to these animals after just a few weeks. I feel that I contributed to getting the lions to stage 1B of the programme. The guys made my actual birthday day memorable by going to Sunset Lodge and Boma restaurant and I would like to say thanks to all who were involved I really appreciate it. Vic Falls is an amazing location as well, from the actual Falls to the bungee jump brige - in your spare time you will have plenty to see and do!! 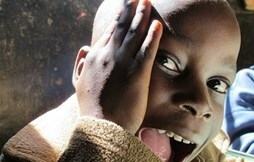 The trip was absolutely incredible and Africa has most definitely made it's mark on my heart. All I have left to say is thank you very much for all your work in making our trip one of our best ever holidays. I cannot fault the project and the people who are a part of it. It was a special experience and will be remembered for many years to come. My time was spent in such close proximity with lions that it felt almost surreal. They are animals of such beauty and grace, yet they progress towards such a bleak and uncertain future. The project offers a hands on experience, and one is an active part of lion conservation in Zimbabwe. Seeing the development of the lions and the subsequent positive impact of my involvement was a heartwarming feeling. 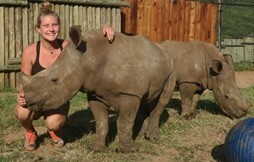 Nowhere else in the world will anyone find such a real and unique experience working with one of the most admired and feared animals in the world; my time at the project was phenomenal. I was extremly impressed with how helpful and quickly all of my questions were answered and also the quailty of information i was given before my trip. Also, i loved the website and how easy it was to navigate yourself around, but also with the wide range of projects it was also able to offer me, allowing me to make sure i definitely picked the trip that suited me most. The project was better then i ever expected it to be and when i arrived in Victoria Falls everyone was so friendly and welcoming so i settled in immeditatley. I think that it was extremly valuable because i definatley feel like i had an big impact on the lions and getting them to stage 2 of the lion encounter project. I also like i was able to help the community by visitng the orpganage and also by seeing their smiles when we came to visit them. Going on this volunteer project was the best decision of my life. I had the most amazing time and I came away from the project feeling like I have really made a difference to the people and lions I was working with. The whole experience seemed surreal to be able to be so close to lions and interacting with them, but this is certaintly something that I will never forget. Everyone is so friendly and welcoming and make you feel right at home. I have been able to take away so much from my trip and learnt my valuable life lessons, and I certaintly plan on booking some more in the future. An amazing life changing experience mainly due to the dedicated and friendly staff. The other volunteers really made me welcome and from day one welcomed me into their team, even though I was 40 years older – interacting with the lions, walking with them in the bush and learning about their behaviour and feeding them was unforgettable. All activities were varied and interesting as well as being well organised. Accommodation was good. Food very average but considering the economic situation in Zimbabwe it was varied and substantial. Staff were friendly as well as knowledgeable and dedicated to the project. All pre-departure information was handled professionally and promptly. Going on this project is the best thing I have done in my life, it has opened my eyes in so many ways and feel I have come back with a much more positive attitude. AT were excellent agents to go through they answered all my questions and were very friendly and helpful. 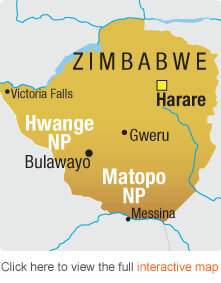 Zimbabwe is such an axazing country and my 4 weeks were well spent although I wish they could have lasted a little longer. All of the people at the lodge I was staying and all the guides at the lion rehabilitation centre were fabulous. I could not have asked for better people to have guided me on my journey. They were all incredible! I am so glad I took the courage to go on this trip and I hope I return. Undertaking this project was undoubtedly the best experience of my life. Not only did I get to work with these incredible lions but I got to explore this beautiful region of Africa and met some amazing people who will remain life long friends. I would recommend it to anyone. I can't wait to go back! The Vic Falls project was an incredible experience. 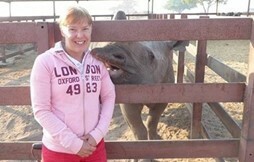 The time I spent in Zimbabwe was like nothing I have ever faced before. I will never forget the experience and will always appreciate everything I learned. The country is beautiful, the people are caring and giving, the staff were knowledgeable and informed, and the program was the experience of a lifetime. The hard part was leaving!